U.S. Corps of Engineers employees clean out drains in the Pomona Lake stilling basin as part of a five-year inspection of the dam. Normally filled with water, the conduit that allows flow from the dam gates was drained for access by inspection crews. POMONA LAKE—Most people probably don’t think about Pomona Lake’s dam much as they drive on it or boat by it. A dam is a dam, right? But luckily for Osage County, which has two federal reservoirs, there are people who think about dams and dam safety every day. 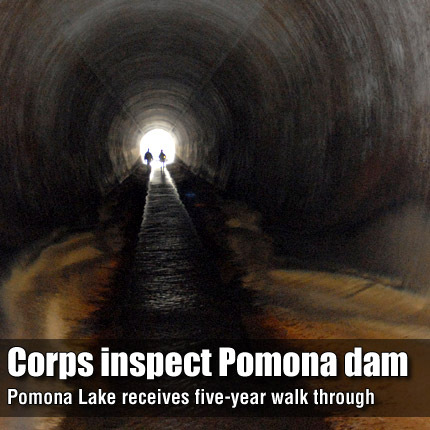 And last week, there was a lot of dam contemplating going on, as about 30 U.S. Army Corps of Engineers’ employees gathered to conduct a five-year inspection of Pomona Lake dam. USACE staff conducts inspections daily, monthly and annually, along with the five-year detailed inspection. Every 10 years, or during every other five-year inspection, the stilling basin below the dam is drained, or “dewatered” in government terminology. During dewatering, the entire water release system is inspected from the downstream basin, up the conduit, to the hydraulically operated gates that control the flow of water out of the lake. In all, four specialized inspection teams, made up of engineers and geologists, swarmed in, under, on top, along side and through the dam last week. A geotechnical team looked at the dirt embankment for abnormalities, checked for seepage, and inspected the lakeside riprap. A structural team checked the interior of the concrete conduit, looked at the gate fixtures, and inspected the control tower, or “anything to do with concrete,” as described by Bob Dimmitt, a retired Corps civil engineer who assisted with the inspection. The structural team also inspected the lake’s emergency spillway, which would only be used in the event the lake filled beyond its capacity.